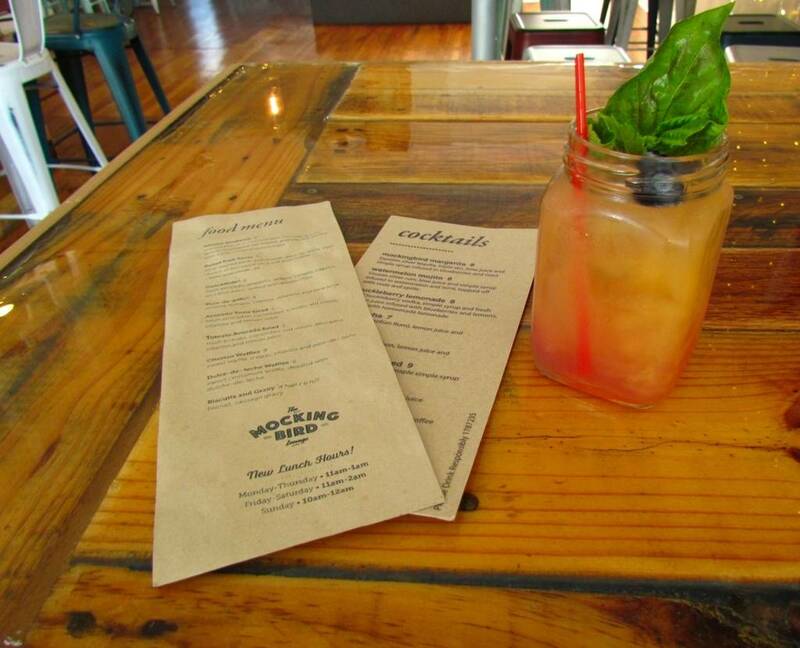 There’s a new bird in town, and it’s the Mockingbird Lounge. We had been seeing some chatter on our social media feeds about this place, and finally had a chance to try it out. This new addition to downtown Kansas City, Kansas is located at 204 Orchard Street. It was a little out of our normal route for downtown, but not too hard to find. The building is located near the original Bethany Hospital site, but the area is now primarily residential. Our visit was early in the evening, so the crowd hadn’t arrived. Of course, during our visit we saw a few more people wander in, so our guess is that they get a little busier around dusk. The interior is brightly decorated with one wall covered in string lights. These compliment the industrial feel, and shine on the multi-colored wooden bar. 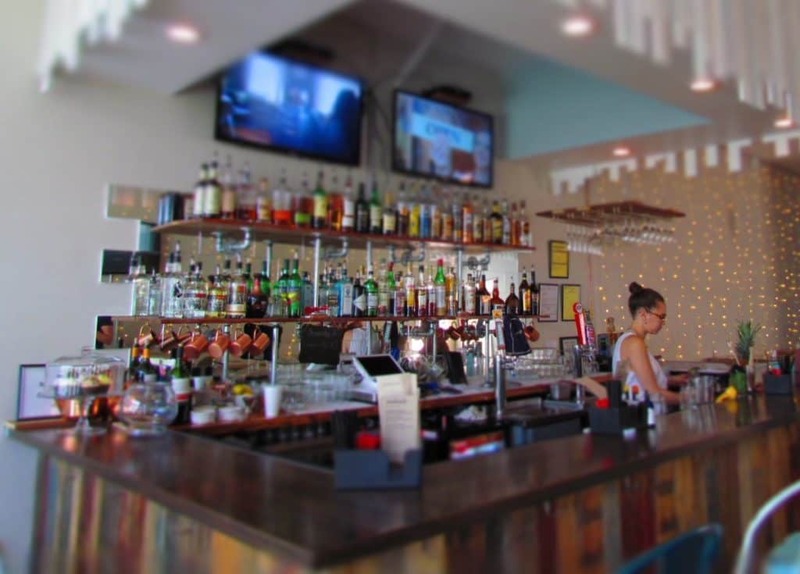 There are an assortment of tables with high-top chairs, and plenty of seats around the bar, as well. The place looks like it would hold 30 or 40 comfortably on he inside. The Mockingbird Lounge has a feature that gives them a unique edge over other downtown bar and grills. 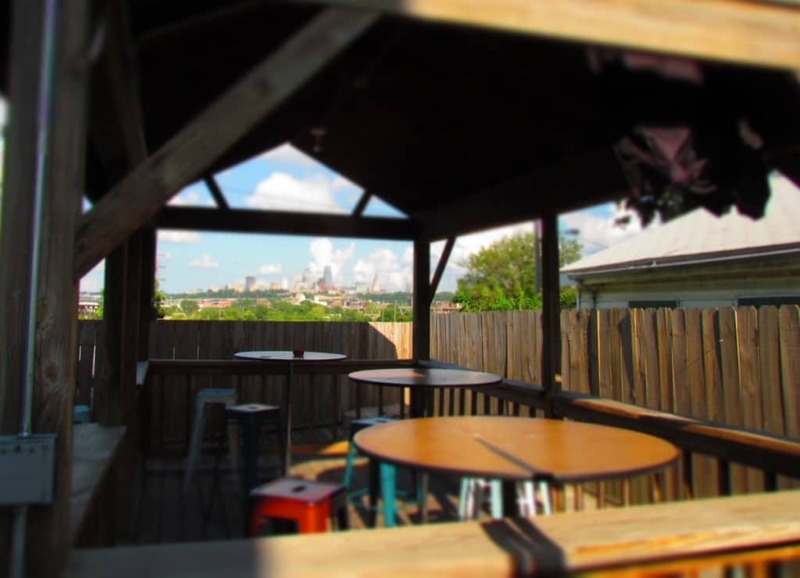 It has an impressive view of the downtown KCMO skyline from the patio. This outdoor area has a variety of seating spots, with a few high-tops on an elevated deck. There are some other seating spots in a courtyard like setting. If you consider that many would be standing around, this area would easily hold another 30 or 40 customers. We stepped back inside, and before long we were greeted by the owner. We spoke for a few minutes, and he told us about his desire to bring life back to this building. We discussed the menu, which he admitted is a little limited for now. His mother prepares the food with her own recipes, which was enough of a reason for us to sample some. 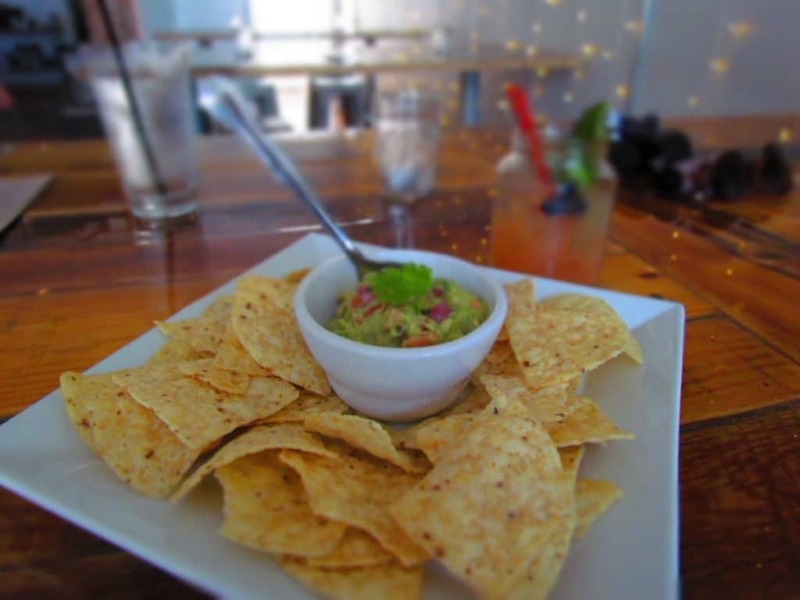 We have noticed on their Facebook page that they have already added some extra dishes and drinks to their repertoire. The owner returned to his duties, and we took a moment to scope out the menu. We had already ordered, and were enjoying a Mockingbird Margarita, which had a nice minty tone. For starters we ordered some Guacamole and chips. It was quite obviously fresh made, and the flavor really popped. Just enough jalapeno to add some kick, but not too much to detract from the avocado. This was a big hit with us. We had plans to dine elsewhere, but we after the success of the guacamole, we wanted to savor another dish. Our choice was to order the Pulled Pork Tacos. 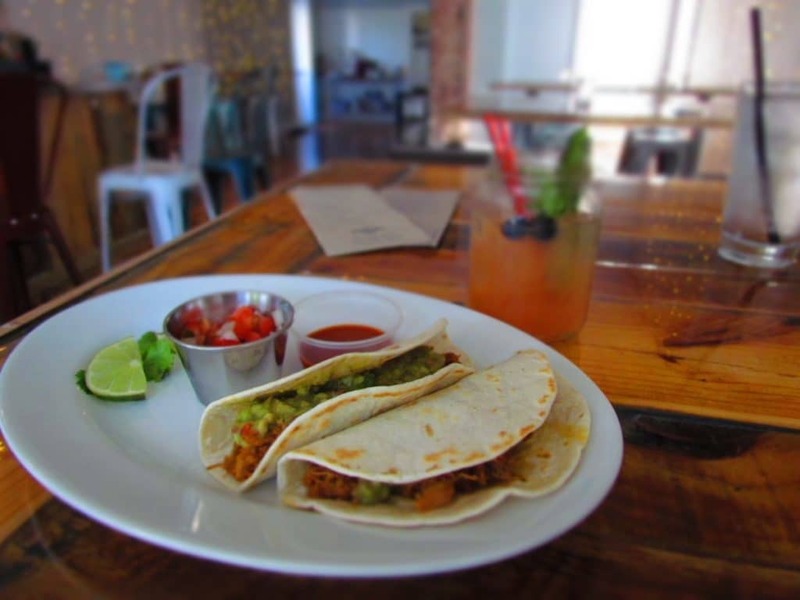 The prepared dish features two soft flour tortillas filled with slow roasted pork, some of the delicious guacamole, and a side of Pico-de-Gallo. Hello! These were even better than the guacamole, and only $5.00. We were tempted to order a second dish, and just fill up here, but it was not to be. While our hearts sunk on the thought of leaving, we quickly determined that a follow up visit (or two or three) would be required to thoroughly test the menu. I know, it’s a rough job, but we just feel compelled to do it. With out time running out, we knew we needed another look at the view. We stepped back out onto the patio, and found a few others enjoying the sights. We chatted for a few minutes about this nice addition to the downtown business family, but finally had to say our goodbyes. I did catch one last glimpse of the view, and decided this would make a great hangout on a cool Fall evening. We know these will be coming soon enough, and now we know where to head for some great food. This is in the spot of the former “View on the Hill” gay bar. The View, as most of us called it, was the oldest gay bar in the Kansas City metro, having been around for well over 20 continuous years. The owner retired and sold it to a guy who ruined it and it was out of business in six months. Thanks for filling in some of the history.